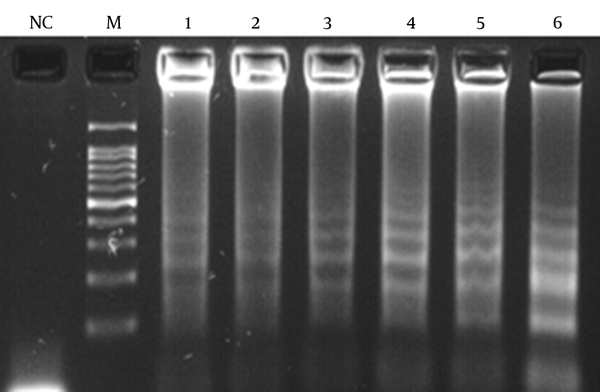 To Cite: Ranjbar R, Afshar D. Isothermal and Sensitive Identification of Streptococcus pneumoniae Using Loop Mediated Isothermal Amplification Assay, Arch Pediatr Infect Dis. 2018 ; 6(1):e61604. doi: 10.5812/pedinfect.61604. Background: As a major pathogen, Streptococcus pneumoniae is responsible for fatal diseases and is deemed to be a major public health problem in the developing countries. Due to its high mortality rate, rapid detection of pneumococci is necessary in medical centers with limited equipment. Loop-mediated isothermal amplification (LAMP) assay is a rapid method to detect bacterial pathogens. Herein, the current study developed a LAMP assay based on the choline-binding protein M (cbpM) gene to detect pneumococci isolates. Methods: A set of 4 primers was designed using the sequence of cbpM, and a LAMP assay was conducted using a different ratio of inner primers to outer primers, dNTPs, and MgSO4 concentrations. The sensitivity of assays was calculated according to 30 clinical isolates of S. pneumoniae. 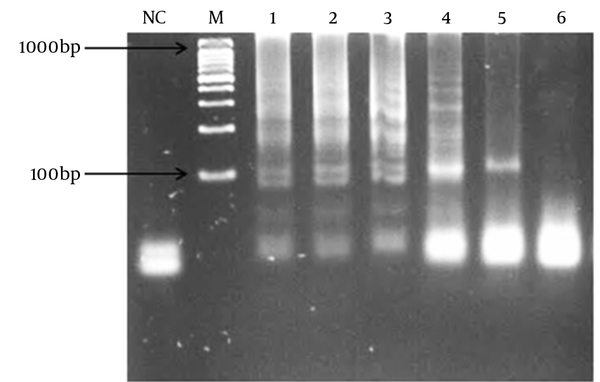 The specificity of primers was also evaluated using 7 non-pneumococcal species. The detection limits of the LAMP assay were also compared with those of the polymerase chain reaction (PCR) assay using a 10-fold serial dilution of the DNA. Results: Optimal temperature and time for the LAMP assay were 62°C and 1 hour, respectively. Its detection limit was only 5 copies of DNA, compared to 50 copies for PCR. When LAMP was tested on 7 non-pneumococcal species, no amplification was observed. Similar to PCR, all 30 S. pneumoniae isolates were detected using the LAMP assay, which showed 100% sensitivity. Conclusions: The LAMP assay is a favorable tool for the rapid detection of pneumococci, and can be employed in medical centers with limited equipment. Streptococcus pneumoniae, an important Gram-positive pathogen, is responsible for infectious diseases such as meningitis, pneumonia, otitis media, and septicemia (1-3). These clinical forms are more common among young and elderly populations due to their lack of immune response to pneumococcal polysaccharide vaccines (4, 5). In such patients, the incidence of pneumococcal diseases caused by non-vaccine serotypes is increasing; a fact that highlights the importance of developing effective pneumococcal vaccines (6). Epidemiological studies also indicated that the incidence of invasive pneumococcal diseases is increasing, despite the availability of conjugate vaccines (7-10). In the United States, S. pneumoniae is responsible for 61% of meningitis cases, while in the developing countries, invasive pneumococcal diseases are estimated to cause 0.7 to 1.0 million deaths annually among young children (11). Therefore, rapid detection of organisms is important regarding the initiation of treatment. Conventional culture of respiratory secretions, including sputum, pleural, or bronchoalveolar lavage, is used to diagnose pneumococcal pneumonia and other lower respiratory tract infections; however, the yields are low and the method is time-consuming (12). In contrast with conventional techniques, molecular approaches to detect and differentiate microorganisms mostly depend on the amplification of DNA and are not affected by low microbial loads (13, 14). In addition, molecular procedures can be applied to organisms that are slowly growing in the culture (15). Advancement of molecular assays lead to the introduction of novel methods with enhanced sensitivity and specificity. A loop-mediated isothermal amplification (LAMP) assay is a diagnostic tool that amplifies DNA under isothermal conditions (3). In this assay, a set of 4 specific primers are annealed to 6 separate regions within the target sequence. The use of 4 primers (F3, B3, FIP, and BIP) results in increased efficiency and specificity (16). The loop primers increase the performance and rapidity of the LAMP method and can reduce the amplification time (17). Production of magnesium pyrophosphate results in white precipitate; therefore, the assay can be observed by the naked eye without any special processing or gel electrophoresis (18). Additionally, the LAMP assay is not affected by inhibitors remaining after the DNA extraction step. Therefore, relatively simple DNA extraction procedures can be used instead of commercial DNA extraction kits (19, 20). Pneumococci are genetically and metabolically similar to some mitis groups of streptococci, which reside in the human oral cavity and even can present commensal organisms (21). Based on the fact that differentiation of S. pneumoniae from mitis group streptococci is a key objective in clinical laboratories, development of a rapid and accurate assay is necessary to detect pneumococci. The differentiation of S. pneumoniae, as a pathogenic streptococcus, from mitis groups of streptococci is important. In the current study, a LAMP assay was used to target the choline-binding protein M (cbpM) as a conserved gene and its sensitivity was evaluated using 30 pneumococcal isolates. The LAMP primers were designed using Primer explorer V4 (https://primerexplorer.jp/lamp4), deploying the software’s default settings to target cbpM gene. The LytA-specific primers were also designed using Primer3 software. The primer sequences are shown in Table 1. Streptococcus pneumoniae ATCC 49619, as well as 30 isolates of pneumococci (isolated from patients hospitalized at Tehran hospitals, Iran) and non-pneumococcal species were cultured on Trypticase soy agar (TSA) supplemented with 5% sheep blood, before incubation for 24 hours at 37°C in a 5% CO2 incubator. DNA extraction was performed using a DNA extraction kit (Promega Wizard Genomic DNA purification kit, Madison, WII, USA), based on the manufacturer’s instructions. The LAMP reaction mixture was prepared using a total volume of 25 µl containing 2.5 µL of 10X Bsm Buffer, 20 mM Tris-HCl (pH 8.8 at 25°C), 10 mM KCl, 10 mM (NH4)2SO4, 5 mM MgSO4, 0.1% Tween 20 (Thermo Scientific-Fermentas, Vilnius, Lithuania), different ratios of outer primers: inner primers, different concentrations of dNTPs (0.4, 0.6, 0.8, 1, and 1.2 mM), different concentrations of MgSO4 (2, 4, 6, 8, 10, and 12 mM), 8 U Bsm DNA polymerase large fragments (Thermo Scientific-Fermentas, Vilnius, Lithuania), and 1 μL of DNA template. The reaction mixture was incubated in a Thermoblock at various temperatures for several minutes and the products were finally electrophoresed on 3% agarose gel. The specificity of the LAMP and PCR assays was evaluated using Streptococcus pyogenes ATCC 8668, S. mutans ATCC 35668, S. agalactiae ATCC 12386, S. sanguinis ATCC 10556, S. mitis ATCC 6249, S. dysgalactiae ATCC 35666, and Staphylococcus aureus. The LAMP and PCR products were analyzed by gel electrophoresis. A 10-fold serial dilution of the DNA was prepared in sterile water, and the LAMP and PCR assays were carried out using different DNA concentrations. The sensitivity of the 2 assays was also evaluated by 30 pneumococci isolates. In all, 30 isolates of S. pneumoniae as well as 7 non-pneumococcal species (including Streptococcus pyogenes, S. mutans, S. agalactiae, S. sanguinis, S. mitis, S. dysgalactiae, and Staphylococcus aureus) were used in the current study. All species were cultured on TSA, and DNA extraction was conducted successfully. As described in the materials and methods section, the present LAMP assay was performed without loop primers. Pure DNA of S. pneumoniae ATCC 49619 was used as a template to determine the optimal conditions for the assay. To optimize and find an optimal incubation temperature for LAMP assay, a standard reaction was carried out under a range of temperatures (60, 61, 62, 63, 64, and 65°C) for 60 minutes; maximum yield was achieved at 62°C. Therefore, the best temperature for the LAMP assay was established as 62°C used for all subsequent applications. To denote the best period of time during which LAMP reaction amplification could yield sufficient observable products, 5 different times limits were applied for the said reaction; good results were obtained at 60 minutes. Different MgSO4, dNTPs, and outer and inner primer concentrations were evaluated and the best results were obtained at 8, 0.4, and 1.6 mM, respectively. The specificity of the PCR and LAMP primers was tested using DNA samples from the 7 non-pneumococcal species. No amplifications were observed indicating specific primers. In order to determine the lowest detection limit of LAMP and PCR (using lytA primers), a 10-fold serial dilution (ranging from 10-1 to 10-9 of DNA) was provided. The results of amplification showed that the minimum copy number of DNA detectable by LAMP and PCR assays was 5 and 50, respectively. Both of the LAMP and PCR assays were positive when tested on the 30 pneumococcal isolates, thus the sensitivity of these assays was 100% using the 2x2 table of sensitivity. Lane (NC) negative control; (M) DNA ladder 100 bp; (1) 60°C; (2) 61°C; (3) 62°C; (4) 63°C; (5) 64°C; (6) 65°C. Lane (NC), negative control; (M), 100 bp DNA ladder; the concentration of MgSO4 is (1) 2 mM, (2) 4 mM, (3) 6 mM, (4) 8 mM, (5) 10 mM, (6) 12 mM. Lane (NC), negative control; (M), 100 bp DNA ladder; concentration of dNTPs is (1) 0.2 mM, (2) 0.4 mM, (3) 0.6 mM, (4) 0.8 mM, (5) 1.0 mM, (6) 1.2 mM. (1) positive reaction; (2) negative control. 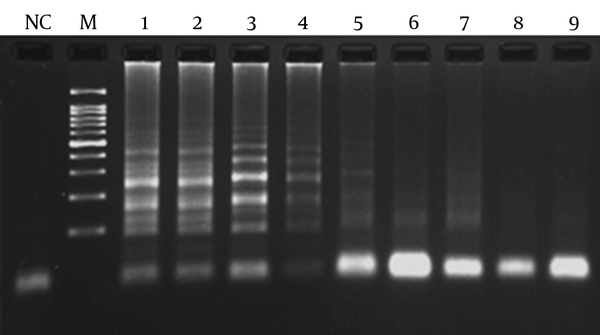 (NC), negative control; (M), 100 bp DNA ladder; (1) dilution of 10-1; (2) dilution of 10-2; (3) dilution of 10-3; (4) dilution of 10-4; (5) dilution of 10-5; (6) dilution of 10-6; (7) dilution of 10-7; (8) dilution of 10-8; (9) dilution of 10-9. Streptococcus pneumoniae is a lethal human pathogen associated with high morbidity and mortality and leading to a global economic burden (22). As the spectrum of pneumococcal diseases is increasing annually, rapid detection of this organism is essential. Currently, there are multiple traditional assays to detect S. pneumoniae from various clinical specimens (23-25). However, the conventional procedures are time-consuming and not cost-effective. In the current study, a LAMP assay was developed to detect S. pneumoniae targeting cbpM. In several studies, autolysin genes (such as lytA) are used as the identification target (26-29). Although the lytA is conserved in all pneumococcal species (30), blasting the sequence shows similarity among the related sequences of mitis group streptococci. The current study applied the basic local alignment search tool (BLAST) to identify and select a specific conserved gene in all pneumococcal species, the results showing that cbpM is conserved in all S. pneumoniae species, but not in any of the mitis groups or other streptococci. The results of the LAMP and PCR assays also showed that all of the S. pneumoniae and non-pneumococcal isolates were positive and negative for the cbpM, respectively. Therefore, this small 387-bp gene can be useful in specific detection of S. pneumoniae. Moreover, lytA can also be an acceptable target to detect pneumococci, although the BLAST results showed its sequence similarity with some sequences of mitis group streptococci. The LAMP assay presented here showed high sensitivity, and was a good tool to detect pneumococcal objectives. In a study by Seki et al., a LAMP assay targeting lytA was developed to detect S. pneumoniae, with acceptable results obtained at 60 minutes at 63°C, with a detection limit of 10 copies of S. pneumoniae DNA and sensitivity of 1000 times higher than that of conventional PCR (31). Regarding the Bsm polymerase used in the current study, the best temperature to produce loop structures was 62°C. In a study by Yang et al., a LAMP assay was developed in combination with a real-time technique targeting lytA, indicating acceptable reproducibility of the real-amp method (32). The current study found that the reproducibility of the LAMP assay decreased when the reaction mixture was prepared under inappropriate conditions such as imperfect thawing of the dNTPs, MgSO4, and Bsm buffer solutions. Therefore, to avoid the user-associated errors, it is recommended that each of the solutions should be thoroughly thawed before adding into the reaction mixture. Wook et al., reported that the detection limit of the LAMP assay was significantly higher than that of PCR (33). Consistent with the results of Wook et al., the LAMP assay presented in the current study was also more sensitive than its PCR counterpart, and it was estimated that the detection of S. pneumoniae required a minimum of 5 copies of DNA. In the current study, the sensitivity of LAMP and PCR assays was 100%, and no DNA amplification was observed with non-pneumococci species, representing cbpM and lytA as specific to pneumococci and ideal for detection targets. The minimum period of time necessary to detect the turbidity of LAMP assay with the naked eye was 60 minutes, which was rapid compared with that of PCR. Indeed, this links back to the isothermal nature of LAMP, in as much as the polymerization of DNA proceeds at an optimum and constant temperature with no loss of time (34). In conclusion, the robust performance of the LAMP assay in the current study suggested that sensitivity of the PCR and LAMP-based detection of S. pneumoniae was similar. However, the LAMP assay had a high detection limit, compared with the conventional PCR method. The authors wish to thank all members of the molecular biology research center of Baqiyatallah University of Medical Sciences, Tehran, Iran, for their assistance. Authors’ Contribution: Study conception and design, Davoud Afshar and Reza Ranjbar; acquisition of data, Davoud Afshar and Reza Ranjbar; analysis and interpretation of data, Davoud Afshar and Reza Ranjbar; drafting of the manuscript, Davoud Afshar and Reza Ranjbar; critical revision, Davoud Afshar and Reza Ranjbar. Financial Disclosure: The authors declared no financial disclosure regarding the materials used in the study. 1. Bogaert D, De Groot R, Hermans PW. Streptococcus pneumoniae colonisation: the key to pneumococcal disease. Lancet Infect Dis. 2004;4(3):144-54. doi: 10.1016/S1473-3099(04)00938-7. [PubMed: 14998500]. 2. Farajzadah Sheikh A, Saki N, Roointan M, Ranjbar R, Yadyad MJ, Kaydani A, et al. Identification of Alloiococcus otitidis, Streptococcus pneumoniae, Moraxella catarrhalis and Haemophilus influenzae in Children With Otitis Media With Effusion. Jundishapur J Microbiol. 2015;8(3). e17985. doi: 10.5812/jjm.17985. [PubMed: 25861433]. 3. Mirzai S, Safi S, Mossavari N, Afshar D, Bolourchian M. Development of a loop-mediated isothermal amplification assay for rapid detection of Burkholderia mallei. Cell Mol Biol (Noisy-le-grand). 2016;62(10):32-6. [PubMed: 27609471]. 4. O'Brien KL, Wolfson LJ, Watt JP, Henkle E, Deloria-Knoll M, McCall N, et al. Burden of disease caused by Streptococcus pneumoniae in children younger than 5 years: global estimates. Lancet. 2009;374(9693):893-902. doi: 10.1016/S0140-6736(09)61204-6. [PubMed: 19748398]. 5. Romero-Steiner S, Musher DM, Cetron MS, Pais LB, Groover JE, Fiore AE, et al. Reduction in functional antibody activity against Streptococcus pneumoniae in vaccinated elderly individuals highly correlates with decreased IgG antibody avidity. Clin Infect Dis. 1999;29(2):281-8. doi: 10.1086/520200. [PubMed: 10476727]. 6. Sabharwal V, Stevenson A, Figueira M, Orthopoulos G, Trzcinski K, Pelton SI. Capsular switching as a strategy to increase pneumococcal virulence in experimental otitis media model. Microbes Infect. 2014;16(4):292-9. doi: 10.1016/j.micinf.2013.12.002. [PubMed: 24361902]. 7. Pebody RG, Hellenbrand W, D'Ancona F, Ruutu P, European Union funded Pnc ECG. Pneumococcal disease surveillance in Europe. Euro Surveill. 2006;11(9):171-8. [PubMed: 17075159]. 8. Zangwill KM, Vadheim CM, Vannier AM, Hemenway LS, Greenberg DP, Ward JI. Epidemiology of invasive pneumococcal disease in southern California: implications for the design and conduct of a pneumococcal conjugate vaccine efficacy trial. J Infect Dis. 1996;174(4):752-9. doi: 10.1093/infdis/174.4.752. [PubMed: 8843213]. 9. Eskola J, Takala AK, Kela E, Pekkanen E, Kalliokoski R, Leinonen M. Epidemiology of invasive pneumococcal infections in children in Finland. JAMA. 1992;268(23):3323-7. doi: 10.1001/jama.268.23.3323. [PubMed: 1453524]. 10. Munoz-Almagro C, Jordan I, Gene A, Latorre C, Garcia-Garcia JJ, Pallares R. Emergence of invasive pneumococcal disease caused by nonvaccine serotypes in the era of 7-valent conjugate vaccine. Clin Infect Dis. 2008;46(2):174-82. doi: 10.1086/524660. [PubMed: 18171247]. 11. Brouwer MC, Tunkel AR, van de Beek D. Epidemiology, diagnosis, and antimicrobial treatment of acute bacterial meningitis. Clin Microbiol Rev. 2010;23(3):467-92. doi: 10.1128/CMR.00070-09. [PubMed: 20610819]. 12. Blaschke AJ. Interpreting assays for the detection of Streptococcus pneumoniae. Clin Infect Dis. 2011;52 Suppl 4:S331-7. doi: 10.1093/cid/cir048. [PubMed: 21460292]. 13. Khardori N. Future of diagnostic microbiology. Indian J Med Microbiol. 2014;32(4):371-7. doi: 10.4103/0255-0857.142233. [PubMed: 25297019]. 14. Ranjbar R, Karami A, Farshad S, Giammanco GM, Mammina C. Typing methods used in the molecular epidemiology of microbial pathogens: a how-to guide. New Microbiol. 2014;37(1):1-15. [PubMed: 24531166]. 15. Burd EM. Validation of laboratory-developed molecular assays for infectious diseases. Clin Microbiol Rev. 2010;23(3):550-76. doi: 10.1128/CMR.00074-09. [PubMed: 20610823]. 16. Notomi T, Okayama H, Masubuchi H, Yonekawa T, Watanabe K, Amino N, et al. Loop-mediated isothermal amplification of DNA. Nucleic Acids Res. 2000;28(12). E63. [PubMed: 10871386]. 17. Nagamine K, Hase T, Notomi T. Accelerated reaction by loop-mediated isothermal amplification using loop primers. Mol Cell Probes. 2002;16(3):223-9. [PubMed: 12144774]. 18. Ushikubo H. [Principle of LAMP method--a simple and rapid gene amplification method]. Uirusu. 2004;54(1):107-12. doi: 10.2222/jsv.54.107. [PubMed: 15449911]. 19. Dong HJ, Cho AR, Hahn TW, Cho S. Development of a loop-mediated isothermal amplification assay for rapid, sensitive detection of Campylobacter jejuni in cattle farm samples. J Food Prot. 2014;77(9):1593-8. doi: 10.4315/0362-028X.JFP-14-056. [PubMed: 25198853]. 20. 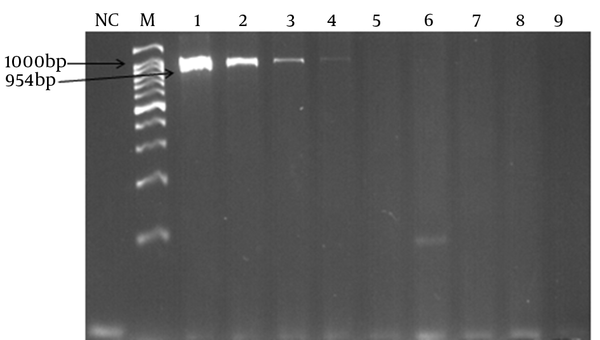 Ranjbar R, Afshar D. Development of a loop-mediated isothermal amplification assay for rapid detection of Yersinia enterocolitica via targeting a conserved locus. Iran J Microbiol. 2015;7(4):185-90. [PubMed: 26697156]. 21. Kawamura Y, Whiley RA, Shu SE, Ezaki T, Hardie JM. Genetic approaches to the identification of the mitis group within the genus Streptococcus. Microbiology. 1999;145 ( Pt 9):2605-13. doi: 10.1099/00221287-145-9-2605. [PubMed: 10517614]. 22. Rayner RE, Savill J, Hafner LM, Huygens F. Genotyping Streptococcus pneumoniae. Future Microbiol. 2015;10(4):653-64. doi: 10.2217/fmb.14.153. [PubMed: 25865199]. 23. Coonrod JD, Rytel MW. Detection of type-specific pneumococcal antigens by counterimmunoelectrophoresis. II. Etiologic diagnosis of pneumococcal pneumonia. J Lab Clin Med. 1973;81(5):778-86. [PubMed: 4698662]. 24. Coonrod JD, Rytel MW. Detection of type-specific pneumococcal antigens by counterimmunoelectrophoresis. I. Methodology and immunologic properties of pneumococcal antigens. J Lab Clin Med. 1973;81(5):770-7. [PubMed: 4633404]. 25. Holmberg H, Krook A. Comparison of enzyme-linked immunosorbent assay with coagglutination and latex agglutination for rapid diagnosis of pneumococcal pneumonia by detecting antigen in sputa. Eur J Clin Microbiol. 1986;5(3):282-6. doi: 10.1007/BF02017782. [PubMed: 3743553]. 26. Carvalho Mda G, Tondella ML, McCaustland K, Weidlich L, McGee L, Mayer LW, et al. Evaluation and improvement of real-time PCR assays targeting lytA, ply, and psaA genes for detection of pneumococcal DNA. J Clin Microbiol. 2007;45(8):2460-6. doi: 10.1128/JCM.02498-06. [PubMed: 17537936]. 27. Gillespie SH, Ullman C, Smith MD, Emery V. Detection of Streptococcus pneumoniae in sputum samples by PCR. J Clin Microbiol. 1994;32(5):1308-11. [PubMed: 7914205]. 28. 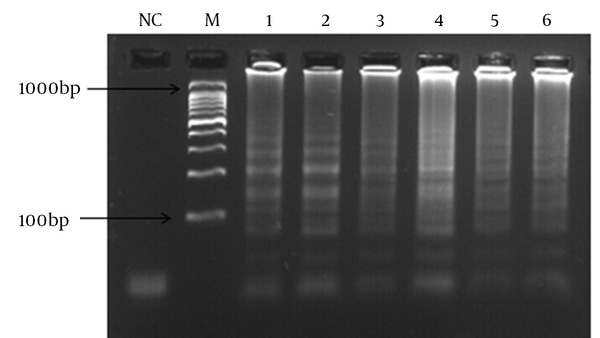 Stralin K, Backman A, Holmberg H, Fredlund H, Olcen P. Design of a multiplex PCR for Streptococcus pneumoniae, Haemophilus influenzae, Mycoplasma pneumoniae and Chlamydophila pneumoniae to be used on sputum samples. APMIS. 2005;113(2):99-111. doi: 10.1111/j.1600-0463.2005.apm1130203.x. [PubMed: 15723684]. 29. Abdeldaim G, Herrmann B, Molling P, Holmberg H, Blomberg J, Olcen P, et al. Usefulness of real-time PCR for lytA, ply, and Spn9802 on plasma samples for the diagnosis of pneumococcal pneumonia. Clin Microbiol Infect. 2010;16(8):1135-41. doi: 10.1111/j.1469-0691.2009.03069.x. [PubMed: 19832718]. 30. Mahboobi R, Afshar D, Pourmand MR, Mashhadi R. Autolytic Activity and Plasma Binding Study of Aap, a Novel Minor Autolysin of Streptococcus pneumoniae. Acta Med Iran. 2016;54(3):196-200. [PubMed: 27107525]. 31. Seki M, Yamashita Y, Torigoe H, Tsuda H, Sato S, Maeno M. Loop-mediated isothermal amplification method targeting the lytA gene for detection of Streptococcus pneumoniae. J Clin Microbiol. 2005;43(4):1581-6. doi: 10.1128/JCM.43.4.1581-1586.2005. [PubMed: 15814969]. 32. Xia Y, Guo XG, Zhou S. Rapid detection of Streptococcus pneumoniae by real-time fluorescence loop-mediated isothermal amplification. J Thorac Dis. 2014;6(9):1193-9. doi: 10.3978/j.issn.2072-1439.2014.07.29. [PubMed: 25276360]. 33. Kim DW, Kilgore PE, Kim EJ, Kim SA, Anh DD, Dong BQ, et al. The enhanced pneumococcal LAMP assay: a clinical tool for the diagnosis of meningitis due to Streptococcus pneumoniae. PLoS One. 2012;7(8). e42954. doi: 10.1371/journal.pone.0042954. [PubMed: 22900070]. 34. Enomoto Y, Yoshikawa T, Ihira M, Akimoto S, Miyake F, Usui C, et al. Rapid diagnosis of herpes simplex virus infection by a loop-mediated isothermal amplification method. J Clin Microbiol. 2005;43(2):951-5. doi: 10.1128/JCM.43.2.951-955.2005. [PubMed: 15695716].